Online learning is a key focus for the University, with the potential to reach new international audiences and ambitious growth targets to match. This project was developed as a pilot, as part of the University’s new web strategy, under the theme of user alignment. This has the objective of making well-informed decisions with the use of audience intelligence and insights. The expected benefits include improved conversion of user journeys to University goals, and better informed web activity through the use of an evolving knowledge base. This project sought to improve the quality and persuasiveness of online content in order to attract more high quality applications that will ideally convert into matriculated students. We also aimed to test routes to market, and to better understand the capability and capacity gap to execute similar improvements on a larger scale. On top of this, we also wanted to pilot new ways of working. The work took the form of a six week collaborative sprint. Central website content: Work to improve the existing central website for online learning. Online MSc in History: Work with colleagues in the School of History, Classics and Archaeology to support them in enhancing the content on their masters programme website. I headed up the user experience strand of these projects, leading on our user research approach and ensuring project outputs met the needs of users. Our first task was to build on pre-existing user research, which had been undertaken by an external UX agency. These reports were high-quality, and the insights were very rich, containing a great deal of detail. For the central website strand, we prioritised the five personas that had been provided as part of that existing user research. We pulled out key insights from the user research reports, and mapped them against each of the personas. The result was a list of users’ information needs, prioritised in order of importance to each of our personas. We balanced this against our priorities as a business. Working with our content design lead Lauren Tormey, we determined which content items were feasible to produce within the remainder of the project’s six week timeframe. The result was a list of prioritised information needs, mapped against proposed items of content. This set our focus, determining what content our minimum viable product needed to include. For the Online MSc in History website, we had to take a slightly different approach. 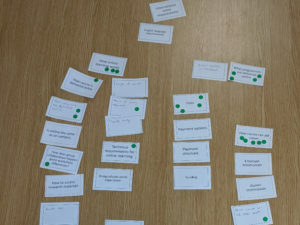 Working with colleagues in the School of History, Classics and Archaeology – including Kacper Lyszkiewicz (E-Learning and Web Development Officer) and Karen Howie (IT Manager) – we developed a workshop format that allowed us to tailor our approach to the School’s particular needs. While the personas we had been provided with did a very good job of representing the University’s online learners as a whole, the History MSc attracts a different mix of students. The age range skews older than the central personas represented, and there is less of an emphasis on career development among History students, who have more of a hobbyist mindset. However, we recognised that a lot of the user insight was still valid for the History strand. 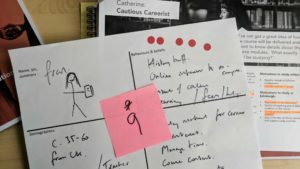 So we designed a workshop that enabled stakeholders from the School of History, Classics and Archaeology to pull the existing personas apart by highlighting key attributes that rang true. Participants then created proto-personas based on those attributes, as well as anything pertinent that wasn’t included in the original research. There was an impressively high level of consensus among the School’s stakeholders about who their key audiences were. The result after a short workshop was four distinctive and well-developed proto-personas. We then used these to rank essential content in a similar manner to the central website. Based on the prioritised needs for the Online History MSc website, we undertook some usability testing of the existing website for some key tasks. This was to provide a benchmark and inform what improvements needed to be made. Given our time constraints, we had to take a lightweight approach. So Kacper and I did some guerrilla testing in and around George Square. In this respect, the timing of the project wasn’t ideal. We had to undertake this testing the week after the end of the semester. This meant students were thin on the ground. However, after spending a short amount of time outside the School’s PhD study space and the Main Library, we got four test sessions completed. Despite the improvised nature of guerrilla testing, we actually managed to find four people that were all quite different to each other. Indeed, they turned out to be broadly representative of our History proto-personas, even though we were approaching people ad hoc. This gave the stakeholders for the History MSc website a good steer when it came to developing content for the new website. After the new central website was deployed for the first time, we undertook some slightly more formal usability testing as part of our learn and improve phases. In parallel, we began using a search engine optimisation tool to audit the new website and measure it against some of our competitors. This allowed us to identify areas of improvement required for the second deployment, which came towards the end of the six week sprint. It is still early days, and monitoring will be an ongoing process. But initial results from our search engine optimisation analysis are promising. A second round of usability testing is currently underway. We will use this to identify further required areas of improvement to be taken forward by Lauren Johnston-Smith, who will be looking after the online learning website beyond the sprint. I approached the six week sprint with a mixture of interest and trepidation. With 17 people on the project team, there was a genuinely cross-functional, collaborative approach. With so many viewpoints to take on board, this meant that at times the project felt like it moved more slowly than we might have liked. And with lots of areas of the University being represented, there were some difficult conversations along the way. However, I really valued the ways of working we adopted as part of this pilot. It is a few years since I have been involved in daily standup meetings. I enjoy the team spirit that standups promote. In this project, they helped us maintain momentum, and provided an easy and open platform to share progress and raise problems. Daily updates meant that issues could be quickly nipped in the bud. In a short space of time, we have delivered two strong sets of webpages based on user needs and meeting the goals of the project. With this many people involved, we might not have achieved that without adopting the sprint mentality and committing to our regular catch-ups and deployment deadlines.